With Independence Day upon us, Americans are coming together once again in celebration of all our many freedoms, among them the freedom to drink outside during daylight hours. Some of us will fish Bud tallboys out of an Igloo on the National Mall; others will knock back rosé on picnic blankets and applejack at backyard barbecues; still others will sip on a pint bottle of Cutty Sark on the same park bench as always. We are a diverse nation. Then, a bit after 8 p.m., the sun will set. The civilized thing to do at this juncture would be to go home, kick back with a little John Locke, and pass out fast. But, no, we must reckon with the stupid fireworks, an integral part of the Fourth of July since 1777, when they befouled the skies above Boston and Philadelphia. Even if you manage to avoid actually looking at their meaningless nonsense—which is essentially the same nonsense, show after show, year after year—their noise will disturb what should have been a pleasant lack of consciousness. Do we not have an unalienable right to be left alone? Let me be clear: I have no beef with firecrackers or bottle rockets or Roman candles or anything else that one might set off in one’s cousin’s backyard. Those are pretty fun, especially if you happen to be in any of the magnificent states where that particular type is banned by law at that particular moment. Doing dangerous stuff in your cousin’s backyard is an important element of American folk culture. Those firecrackers are handsomely humble. Meanwhile, the professional fireworks display is an exercise in pomposity, aggression, triumphalism, and hubris. The pyrotechnician—and, more importantly, his patron—intends to ornament the night sky beyond the powers of God himself. He means to inspire awe for little purpose other than to demonstrate his power. The first great fireworks nuts in the Western world were Peter the Great (who put on a five-hour show to celebrate the birth of his first son) and Louis XIV (who, with a specially equipped sundial, used them to tell time at Versailles). Fireworks are imperialist and, as we used to say in school, hegemonic. That they are popularly believed to be populist entertainment does not say much for the populace. No way were all men created equal. 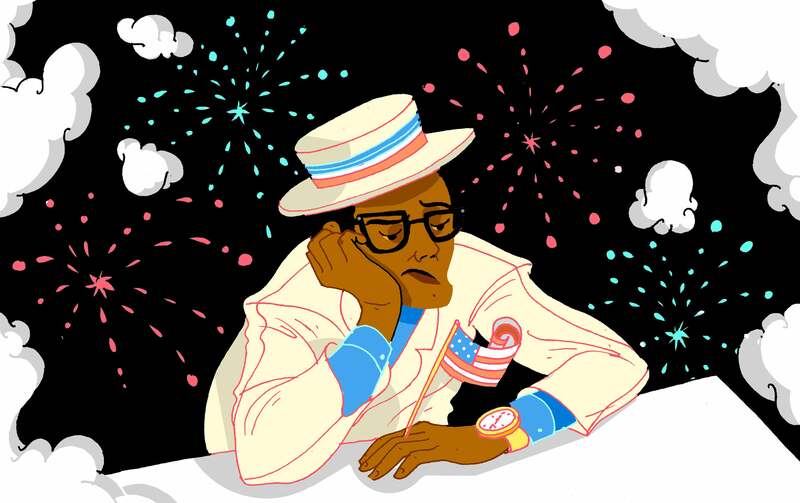 According to some of the country’s top statisticians, exactly half of them are below average, and that is the segment of the population most likely to get too excited about fireworks. Other species highly intrigued by bright lights include moths and venison. Hearing people hoot lustily at a crossette or chrysanthemum, I assume that they are the same sort who lined up at bear-baiting pits back in the day and, in modern times, watch Howie Mandel reality shows. Of course, I would be no better than those yahoos were I not to add some nuance to this argument. Pyrotechnicians deserve credit for doing moderately interesting things with light. Light can be pretty, and fire can be cool. Perhaps human culture really began on that Paleolithic night when man first decided that, instead of going out to dinner with his friends, he’d stay in and sit around the fire just for the hell of it, for purely recreational purposes. Who doesn’t enjoy the glow of a Yule Log? The rowdy roar of a good bonfire? The lambent flicker of an incriminating document? One New Year’s Eve in Amsterdam, I watched a steady orange flame consume an upright piano in the middle of the narrow road. My extreme pleasure was tainted only by the regret that it was not a concert grand. Do you remember Cary Grant and Grace Kelly in To Catch a Thief, their union symbolized by a great crash of fireworks outside their balcony overlooking the harbor of Monte Carlo? The only thing wrong with that scenario, it has always seemed to me, is that any normal couple would be out on the balcony enjoying the fireworks, and not inside tumbling around on a bed. Really, George? Grace Kelly is in the hotel room ready to go, and you’re going to put her on hold to take a peek at some sparklers? Fireworks are magical only in their capacity to derange.